Easy to use, durable stand-alone system; provides high level performance in flame treating the surface of plastic bottles. This unit will increase the surface tension on plastic bottles, plastic parts, plastic novelties, etc. Increasing the dyne level will prepare the parts for your gluing, painting, or printing process. Precision mixing system coupled with high quality burner system, either ring or flat, for consistency throughout entire surface treating operation. Designed so burners pivot with the chute as a unit to vary the speed of the part. Hand-fed unit; automatic feeder can be added as an option. 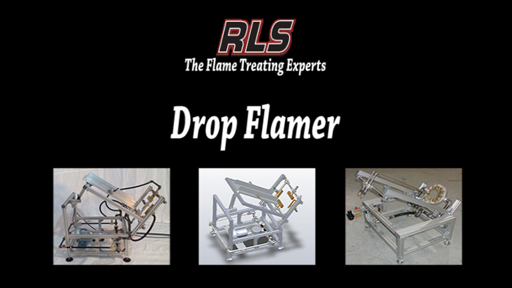 Provides gravity-free drop through flaming on a wide variety of parts. System can be mounted to existing plastic extrusion line. Unique feature pivots the ring to match the angle of the chute and keeps product dropping through the center of the ring at all times. Increased adjustability for wider parts. Has been used in the industry to flame treat frisbees and plastic bottles on the same machine. Plastic novelty items, mugs, short tubes, medical products, and even square bottles have been treated successfully with this machine. Capable of top and bottom sheet treating simultaneously.